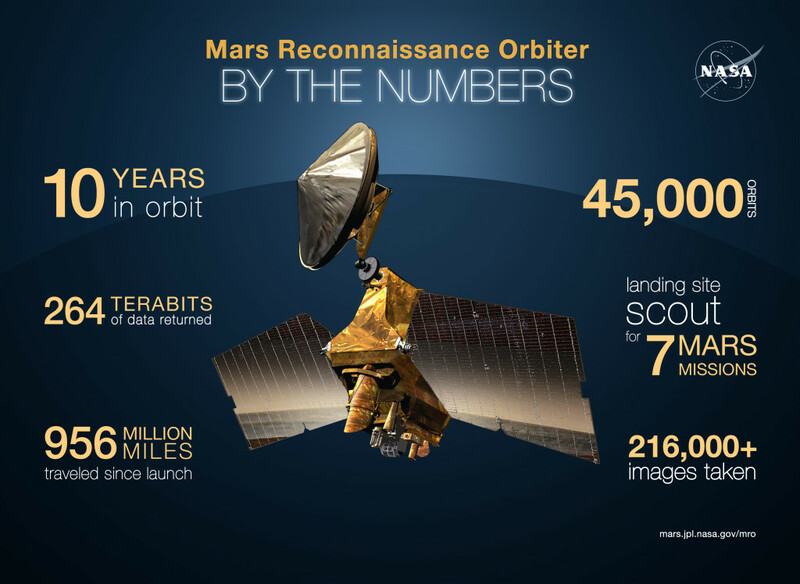 March 10, 2016 – True to its purpose, the big NASA spacecraft that began orbiting Mars a decade ago this week has delivered huge advances in knowledge about the Red Planet. NASA’s Mars Reconnaissance Orbiter (MRO) has revealed in unprecedented detail a planet that held diverse wet environments billions of years ago and remains dynamic today. “This mission has helped us appreciate how much Mars — a planet that has changed greatly over time — continues to change today,” said MRO Project Scientist Rich Zurek of NASA’s Jet Propulsion Laboratory, Pasadena, California. JPL manages the mission. Data from MRO have improved knowledge about three distinct periods on Mars. Observations of the oldest surfaces on the planet show that diverse types of watery environments existed — some more favorable for life than others. More recently, water cycled as a gas between polar ice deposits and lower-latitude deposits of ice and snow, generating patterns of layering linked to cyclical changes similar to ice ages on Earth. Dynamic activity on today’s Mars includes fresh craters, avalanches, dust storms, seasonal freezing and thawing of carbon dioxide sheets, and summertime seeps of brine. The mission provides three types of crucial support for rover and stationary lander missions to Mars. Its observations enable careful evaluation of potential landing sites. They also help rover teams choose routes and destinations. Together with NASA’s Mars Odyssey, which has been orbiting Mars since 2001, MRO relays data from robots on Mars’ surface to NASA Deep Space Network antennas on Earth, multiplying the productivity of the surface missions. The mission has been investigating areas proposed as landing sites for future human missions in NASA’s Journey to Mars. The spacecraft’s two large solar panels give MRO a wingspan the length of a school bus. That surface area helped with atmospheric drag during aerobraking and still cranks out about 2,000 watts of electricity when the panels face the sun. Generous power enables the spacecraft to transmit a torrent of data through its main antenna, a dish 10 feet (3 meters) in diameter. The total science data sent to Earth from MRO — 264 terabits — is more than all other interplanetary missions combined, past and present. For example, the mission’s High Resolution Imaging Science Experiment (HiRISE) camera, managed by the University of Arizona, Tucson, has returned images that show features as small as a desk anywhere in observations that now have covered about 2.4 percent of the Martian surface, an area equivalent to two Alaskas, with many locations imaged repeatedly. The Context Camera (CTX), managed by Malin Space Systems, San Diego, has imaged more than 95 percent of Mars, with resolution showing features smaller than a tennis court. The Compact Reconnaissance Imaging Spectrometer (CRISM), managed by Johns Hopkins University Applied Physics Laboratory, Laurel, Maryland, also has imaged nearly 98 percent of the planet in multiple visual-light and infrared wavelengths, providing composition information at scales of 100 to 200 yards or meters per pixel.